Hands up if you're here because you were wondering whether that snail facial you saw on 100 Years Younger In 21 days is actually a real thing? Perhaps, you even want to try it for yourself? Don't worry, curiosity didn't kill the cat in this case. But it did squeeze some juicy slime from our mollusc friends. Now this is both embarrassing and obnoxious sounding, but as a beauty editor that regularly totes home piles of products and always has a standing queue of items that need to be tested (the most fun to-do list I have, for sure), sometimes it's downright hard to keep track of which fabulous new serum is what. Case in point: My beloved editor Megan recently handed me a skin-care product and said something along the lines of, "Want to put snail slime on your face?" To which my response was "Hell, yeah." I excitedly squirrelled the bundle away into my to-try pile. Well, turns out, I had been using the famous Snail Serum for days without noticing, because, well, Immunocologie's Super 7 Elixir neither looks, smells, nor feels like a gimmicky product with a weird ingredient. It's a lovely, light serum that smells vaguely herbal, disappears into skin without a trace, and adds major glow over time. And, the packaging? As chic as can be. It's a snail in sheep's clothing, I tell ya. So, the question remains: Why snail slime (or mucin, if you want to get all technical)? According to the brand, snail mucin boosts fibroblasts, which create collagen and elastin, which therefore make skin more resilient and less prone to wrinkling. In combination with Immunocologie's signature Vital Oligo complex — which is comprised of antioxidants, nourishing oils, probiotics, hyaluronic acid, and naturally derived peptides — the snail mucin promises a healthier, happier visage that's less susceptible to damage over time. Bottom line? While I may be a fickle product user, this pretty baby will be keeping a permanent spot in my overstuffed medicine cabinet. Because flawless skin is worth the clutter, right? 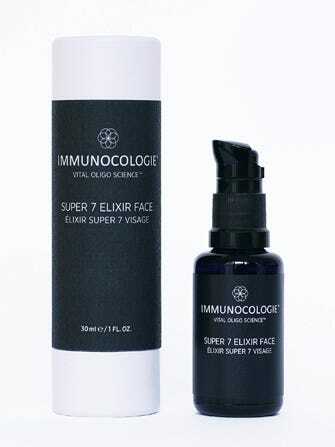 Immunocologie Super 7 Elixir, £240, available at Cult Beauty.